MWN Blog: Updated look at the holiday weekend & "Dr. Dewpoint" strikes again! Updated look at the holiday weekend & "Dr. Dewpoint" strikes again! It's been an interesting start to the week in Mid-South weather. We started off on Monday with an outflow boundary, or gust front, and thunderstorms (as predicted) that turned out to bring some short-lived flooding and sporadic wind damage and hail (that we didn't predict). Fortunately, the damage was all fairly low end, the water ran off quickly, and the hail melted just as fast. The front that triggered the storms pushed through the area, bringing slightly less humid air (see a more accurate description below) on Tuesday. However, also with less notice than we like to provide, another strong gust front moved through the Memphis metro on Tuesday evening. It brought the customary strong wind but also spawned a couple of picturesque thunderstorms that dropped localized heavy rain. The storms were followed by a gorgeous (double) rainbow visible to many in the city, then a terrific sunset as the clouds cleared. We now are looking at more mid 90s temperatures and typical summertime humidity/dewpoints for the Independence Day weekend, along with daily low thunderstorm chances as a frontal system sits just to our north. For now, storm chances are at 20-30% each day from Friday through the 4th, so it's darn near impossible to know whether your favorite fireworks event (and there are many) will go on as scheduled. The good news is that this type of pattern usually favors the highest storm chances in the heat of the day into early evening, so hopefully by dark, any scattered storms from that day will yield to the setting sun and allow the show(s) to go on! 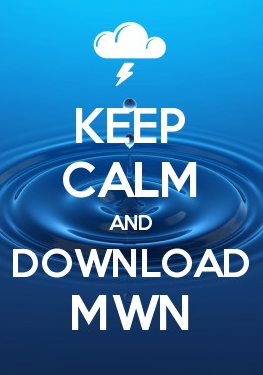 Stay tuned to the MWN Forecast on the web or our mobile apps for the latest forecast info, and follow us on social media (links below) for regular updates. 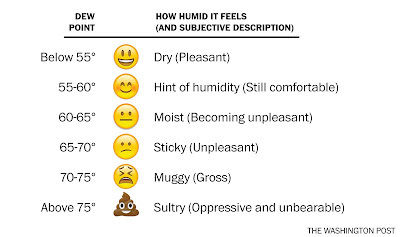 Dr. Dewpoint's lesson on "humidity"
Humidity is a word that is used to describe how much moisture is in the air or how muggy it is, but in most cases, it's not actually the best word to define the "mugginess" of the air. The word humidity is usually used to mean relative humidity, the value given when you look at the current conditions for a location. But if you pay attention, you'll notice that the relative humidity is highest in the morning hours and lowest in the afternoon. This is true even if the amount of moisture in the air actually increases! Because it is relative, the humidity varies according to the temperature. As the temperature warms, even if the amount of moisture in the air remains the same, the relative humidity value actually goes down. As the air cools, the relative humidity rises, given the same amount of actual moisture in the air. What we actually mean when we say "the humidity is rising" is best described using the term dewpoint. The dewpoint is a measure of the actual moisture content of the air and is not dependent on temperature. The dewpoint is the temperature that air must be cooled to in order to achieve saturation, or 100% relative humidity. It's an absolute measure of humidity rather than a relative one. So, if the dewpoint is 40° and the temperature is 80°, relative humidity (or just "humidity") is 24%. Give the same amount of moisture in the air (a dewpoint of 40°), if the air temperature drops to 50° overnight, the relative humidity rises to 69%. But the amount of water molecules in the air has not changed! Therefore, since humidity changes based on the temperature throughout the day, dewpoint is the best measure of how "muggy" it feels. Here in the south in the summertime, it is not unusual at all to have dewpoints of 70°. That is a muggy day and is pretty uncomfortable to most people! When we get dewpoints to fall closer to 60° (which we approached today), the air feels more comfortable, even though for most people living up north, that would still be a muggy day (it's all relative - ha!). 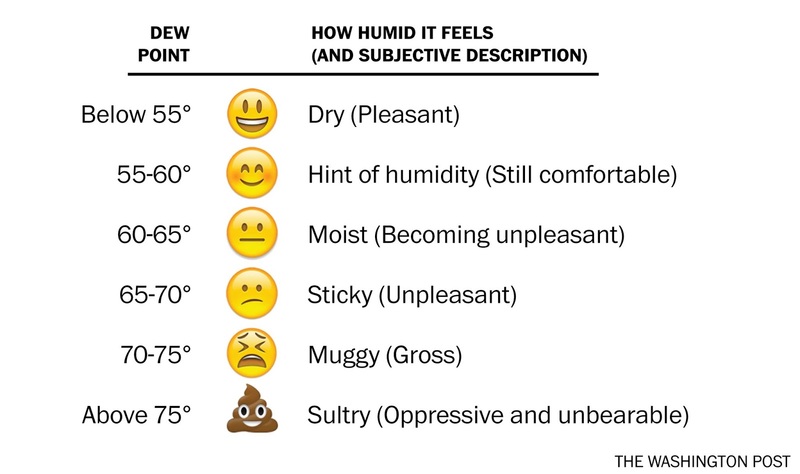 This chart provides an adequate description of how humid it feels in certain dewpoint ranges fin our part of the country. Graphic courtesy The Washington Post. A week or so ago when we had Heat Advisories and heat indices of 110°+, dewpoints were well into the mid and even upper 70s. That's pretty oppressive! Sweat just doesn't evaporate that well with that much moisture already in the air, which means your body's cooling process doesn't work as well. That is why we recommend taking it easy with frequent breaks, proper attire, and plenty of water when Heat Advisories or Warnings are issued. The body simply can't cool itself well in those conditions. So the next time you are wondering how muggy it will be - it's best to check the forecast dewpoint, rather than the humidity. It's a better measure of just how muggy it will be! Sometimes it really isn't the heat - it's the humidity dewpoint!